The name of this barn quilt square is State Capitol Harrisburg. It was taken from a Sampler Quilt hand-quilted by Verda Culler Schue in the early 1980’s. The interest in quilting came from a collection of handmade quilts done by my ancestors of the Mr. & Mrs. Alexander Mellott Family, my grandparents. I can still remember helping my mother, Maude Ellen Mellott Culler, take the heavy wooden lid off the handmade box to “shake out” the quilts, fold them neatly, put them back, along with moth balls and cigars to preserve them from the moth. 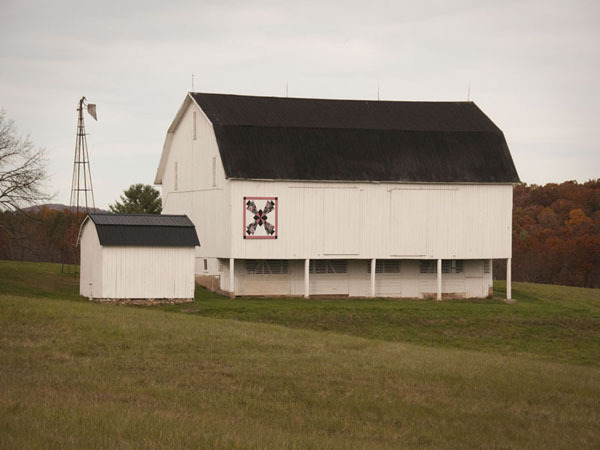 This barn quilt square was installed on a barn built to replace the original that was blown down during a storm. Everything was built, except for putting on the roof. The new one was built on the same foundation, on a farm purchased by my grandparents in 1913.